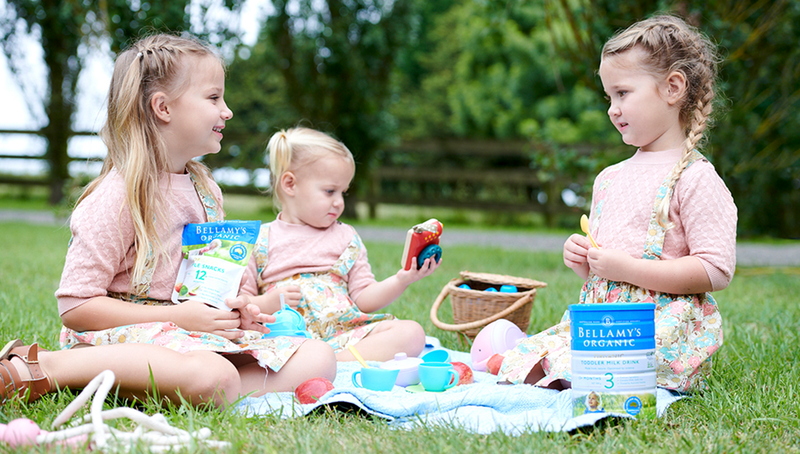 Bellamy’s Organic Step 2 Follow-on Formula is nutritionally balanced and carefully crafted with key ingredients that complement the nutritional and developmental needs of growing babies from 6 months through to 12 months of age. All our formula tins will provide you with the necessary measuring scoop and preparation instructions, along with a feeding table to guide you on how much your baby will need each day. Follow instructions exactly. Prepare bottles, teats and water as directed. Do not change proportions of powder except on medical advice. Organic milk solids [organic demineralised whey powder, organic skim milk liquid or powder, organic whole milk liquid or powder, organic lactose powder], organic vegetable oil [organic palm olein oil, organic soybean oil, organic coconut oil, emulsifier (organic soybean lecithin)], organic galacto-oligosaccharides liquid (GOS) from milk, dried DHA and ARA oils [fish oil (tuna), sodium caseinate, emulsifier (soybean lecithin), antioxidants (sodium ascorbate, mixed tocopherols, ascorbyl palmitate)]. MINERALS: Calcium carbonate, sodium citrate, potassium citrate, magnesium chloride, potassium chloride, di potassium hydrogen orthophosphate, di calcium hydrogen orthophosphate, ferrous sulphate, zinc sulphate, copper sulphate, manganese sulphate, potassium iodide, sodium selenite. VITAMINS: Sodium ascorbate, vitamin E acetate, niacinamide, vitamin A acetate, vitamin D3, calcium pantothenate, thiamine hydrochloride, pyridoxine hydrochloride, folic acid, vitamin K1, d-biotin, vitamin B12. ALLERGENS: Contains milk, fish & soy. 1 scoop = 8.8 g of powder. The Feeding Table is only a general guide. Your baby may need more or less than indicated. NOTE: Consumption of vitamin or mineral preparations are not necessary in addition to this product. Discard any unfinished feed. Use only the enclosed scoop. Always add one level scoop (8.8 g) of powder to each 60 mL of cooled, boiled drinking water. Each bottle should be prepared individually. IMPORTANT NOTICE: BREAST MILK IS BEST FOR BABIES. BEFORE YOU DECIDE TO USE THIS PRODUCT, CONSULT YOUR DOCTOR OR HEALTH WORKER FOR ADVICE. WARNING: FOLLOW INSTRUCTIONS EXACTLY. PREPARE BOTTLES, TEAST AND WATER AS DIRECTED. DO NOT CHANGE PROPORTIONS OF POWDER EXCEPT ON MEDICAL ADVICE. INCORRECT PREPARATION CAN MAKE YOUR BABY VERY ILL. INFANTS OVER 6 MONTHS SHOULD BE OFFERED SOLID FOOD IN ADDITION TO THIS PRODUCT. Always wash hands before preparing. Wash and rinse bottle and all utensils thoroughly. Use only the enclosed scoop. Boil fresh drinking water and allow to cool until lukewarm. Consult Feeding Table. Pour exact amount of warm, previously boiled water into the sterilised bottle. Fill the measuring scoop with formula powder and level off using the levelling blade on the tin. Always add one level scoop of powder for each 60 mL of water in the feeding bottle. Place cap on bottle. Shake or swirl until powder dissolves. If required, cool the prepared formula by holding the bottle under cold, running water. Before feeding your baby, make sure the prepared formula is at the right temperature by testing on your wrist. If prepared formula is not consumed immediately, refrigerate and use within 24 hours.